Volunteering is a great way to make new friends and feel useful. 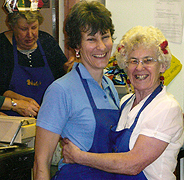 Wesleys Café runs with over 70 volunteers who each contribute a little time on a regular basis. The Café would always be pleased to hear from you if you could spare a couple of hours. Just pop in and talk to Mary or Lynne, our cooks) to discuss the possibilities. Perhaps you are good at organising things and / or supporting group activities. Computer or design skills: are needed to help to prepare and run the computer programme for morning worship; or perhaps you could help to keep one of our websites updated? Secretarial and note-taking skills: many of our meetings need someone to take the minutes from time to time: could you help with this occasionally? Maybe you could start up a new group to introduce local people to something that you are skilled in – e.g. arts, music, crafts, health, flower arranging etc. If you have some financial skills, could you help our Treasury Team? Enjoy gardening? Talk to Avril Dawes or Ruth Anderson about the Gardening Team.